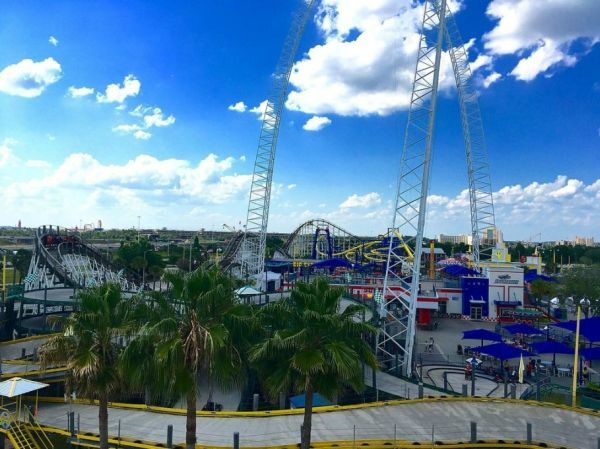 Racing through I-Drive’s past, present & future there’s a common theme that you can certainly get revved up about! In a short 45 years, the drive has gone from a small mile and a half-paved road, with a few attractions and hotels, and grown to become one of the most entertaining places to visit in Central Florida. Put on your seatbelts and prepare for a wild ride. You’re about to take a spin down memory lane with us. One of International Drive’s first racing establishments, Malibu Grand Prix was a staple of International Drive youth. Just check out this commercial from the 80s. Malibu Grand Prix opened doors to fun! Their idea helped springboard racing centers across the country. 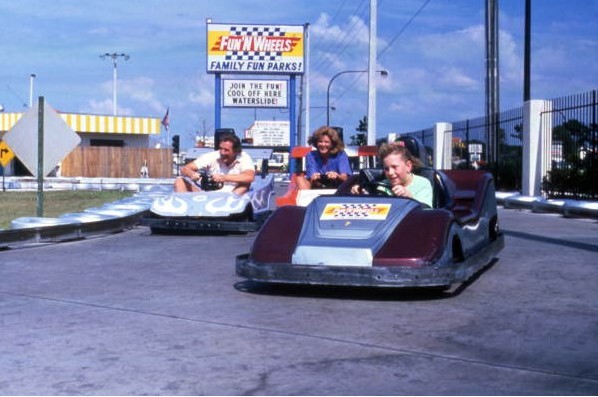 In 1979, Fun Spot America Founder John Arie, Sr opened Fun N Wheels – one of the first themed action parks with multiple tracks, family rides, and an open-air arcade. The concept was a hit with locals and tourists alike and the park became a staple in the community. Despite its promise, Arie sold Fun N Wheels and later opened a new park in 1997 called Fun Spot Action Park (later named Fun Spot America) near its predecessors previous location. The new park featured a signature, patented designed multi-level go-kart track, a 102-foot-tall Ferris wheel, and a two-story video arcade. 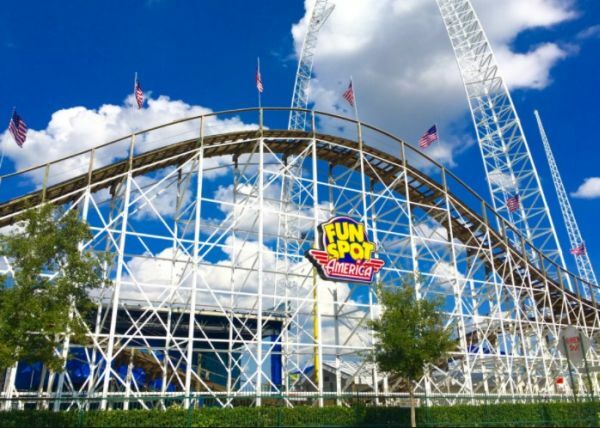 The new staple of family fun, Fun Spot America purchased an additional 10 acres of vacant land and added the world’s second tallest Skycoaster (second only to Fun Spot America – Kissimmee’s location), and two new roller coasters, the wooden White Lightning and the steel Suspended Family Coaster Freedom Flyer. After years of growth and restructuring, on June 8, 2013 Fun Spot America held a grand re-opening celebrating the tripling size of the park and the park’s 15th anniversary. One of the hidden treasures on International Drive, Magical Midway features two wooden elevated go-kart tracks, a fast track, bumper cars, bumper boats, carousel, Space Blast tower, and is home to one of the largest arcades in Orlando. In addition to these fabulous attractions Magical Midway hosts the world’s largest Sling Shot and Starflyer – attractions that only the bravest of the brave attempt! In December of 2014, I-Drive NASCAR raced onto International Drive, putting you in the driver seat with champions of the industry. 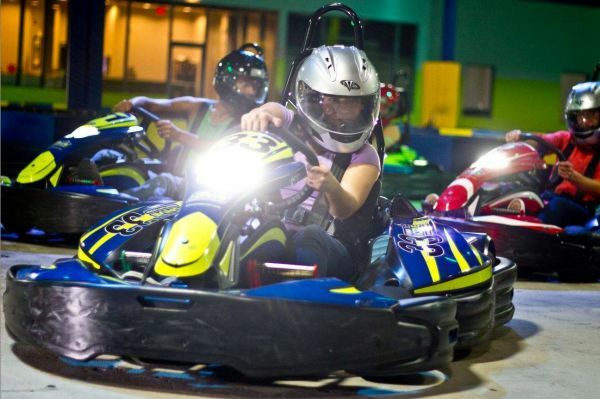 The family-friendly entertainment complex features kart racing, a bowling alley, gaming arcade, dine-in restaurant and corporate meeting space where NASCAR fans can share a passion for fast cars and thrilling racing. In true NASCAR fashion, visitors receive a “Racer Card” that allows guests to track their own racing times, which are also used to queue for upcoming races. We are excitedly awaiting the arrival of Andretti Indoor Karting & Games – and their electric go karts with instant acceleration! Put the pedal to the metal around hairpin turns and long straightaways. Taking it up a notch, Andretti will let you train like a professional with racing simulators! It’s so realistic that you can feel the motion and vibrations of the car, experience the tension of the seat belt, and hear the roaring engines on the track. This is the only simulator of its kind in commercial use in the United States and it’s only available on International Drive!